The Xen.org and OpenNebula.org open source communities are working together to add XCP support to OpenNebula. This collaboration will produce the OpenNebula Toolkit for XCP, which will be hosted as freely available open source project on OpenNebula.org. The XCP project team and Xen.org community will provide technical guidance and assistance to the OpenNebula open-source project. “We are really excited to collaborate with Xen.org in offering Xen Cloud Platform support. This will be a huge step forward towards achieving a complete open-source stack for cloud infrastructure deployment. We are planning to have a first prototype of the integration by November.” said Ignacio M. Llorente, Director of OpenNebula Project and Chief Executive Advisor at C12G Labs. “I am really pleased that Xen and OpenNebula are collaborating on a new project, building on a history that goes all the way back to 2008, OpenNebula 1 and Xen 3.1. This renewed collaboration, together with projects such Kronos which will deliver XCP with different Linux distributions, will make building rich Xen based clouds much easier.” said Ian Pratt, Chairman of Xen.org and SVP, Products at Bromium. OpenNebula is a fully open-source, Apache licensed toolkit for on-premise IaaS cloud computing, offering a comprehensive solution for the management of virtualized data centres to enable private, public and hybrid clouds. OpenNebula interoperability makes cloud an evolution by offering common cloud standards and interfaces, leveraging existing IT infrastructure, protecting existing investments, and avoiding vendor lock-in. OpenNebula is used by many research projects as a powerful tool for innovation and interoperability, and by thousands of organizations to build large-scale production clouds using KVM, Xen and VMware. This new collaboration will extend Xen support in OpenNebula to include XCP, bringing the rich capabilities of XenAPI to OpenNebula. XCP is an open source, GPLv2 licensed, enterprise-ready server virtualization and cloud computing platform, delivering the Xen Hypervisor with support for a range of guest operating systems including Windows® and Linux® network and storage support, management tools in a single, tested installable image. XCP addresses the needs of cloud providers, hosting services and data centres by combining the isolation and multi-tenancy capabilities of the Xen hypervisor with enhanced security, storage and network virtualization technologies to offer a rich set of virtual infrastructure cloud services. In addition, XCP addresses user requirements for security, availability, performance and isolation across both private and public clouds. The collaboration will add OpenNebula support to the list of Cloud Orchestration stacks that build on top of XCP. This is excellent news for the community!. You can visit the Xen.org blog for additional information. Stay tuned, the first release will be available in few weeks. 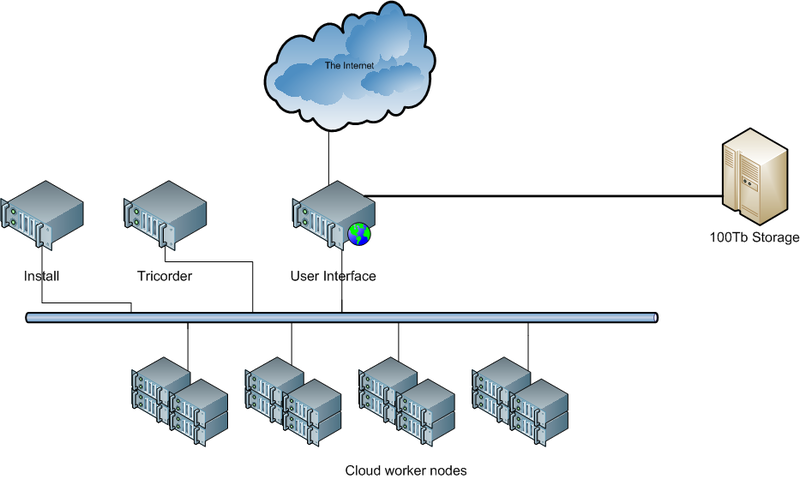 OpenNebula is being used by many leading supercomputing (SARA, CESGA, CESCA, PDC-KTH, PIC…) and research centers (ESA, CERN, FermiLab, CSIRO, KIT, Harvard SEAS…) to build HPC and science clouds for hosting virtualized computational environments, such as batch farms and computing clusters, and for providing users with new “HPC as a service” resource provisioning models. One of our recent invited talks in this field, at ISC Cloud Computing 2011, illustrates the benefits of using OpenNebula both as an infrastructure tool, to build private clouds, and as an provisioning tool, to build public clouds. OpenNebula 3.0 brings many other new features to build cutting-edge cloud infrastructures. 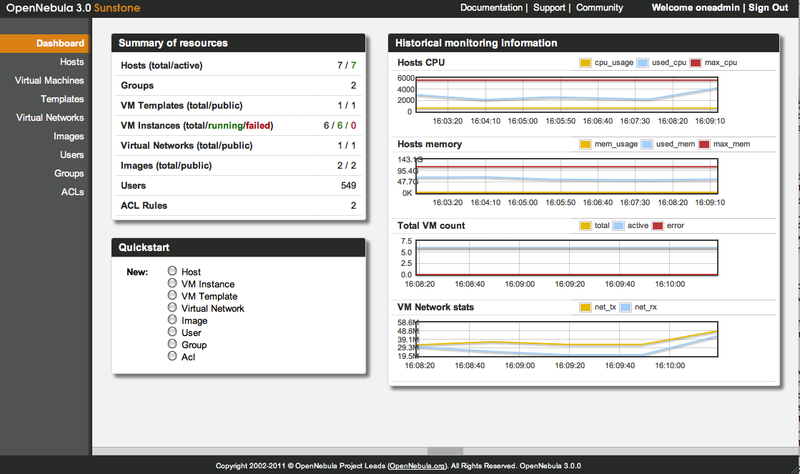 OpenNebula 3.0 is a fully open-source technology. You have the software, the guides and our support to deploy your cloud infrastructure for High Performance Computing. This last month has been a busy one, thanks to the release of OpenNebula 3.0. Here’s our monthly newsletter with the main news from the last month, including what you can expect in the coming month. Of course, the big news is that we released OpenNebula 3.0! If you haven’t done so yet, check out the release notes and download it now. One of the new features in OpenNebula 3.0 is an improved Sunstone Web UI. To get a better idea of how it works, check out this screencast. Remember we also have a free cloud testbed you can try out yourself (including Sunstone); in fact, we recently updated the cloud testbed to 3.0. You can also read our blog post “Building a Cloud for Mission-Critical Applications“, which summarizes how the new features in OpenNebula 3.0 can be used to support mission-critical use cases. Finally, we are already working on OpenNebula 3.2. Check out the current planned features for 3.2. If you’d like to suggest new features, or discuss some of the proposed ones, please send a message to the OpenNebula discussion mailing list. Lots of stuff happening in the OpenNebula community too! We revamped the OpenNebula community wiki, which now has its own site: http://wiki.opennebula.org/. Any OpenNebula community member can use this wiki to share howtos or provide links to guides, white papers, or use cases. C12G Labs released a new guide on integrating SUSE Studio with OpenNebula. This guide addresses how to create or adapt any SUSE Studio appliance by simply adding a 20-line script to the appliance, which will integrate the appliance’s network with OpenNebula and will handle the contextualization process. We have two new ecosystem components: Hector Sanjuan, Pablo Donaire, David Rodriguez contributed OneVBox, a VirtualBox driver for OpenNebula, and the Cloud Research Lab at Furtwangen University contributed StudiCloud, a backend-proxy for Shibboleth Single-Sign-On authentication in OpenNebula. Moreover, Nikolay created a wiki page about how to integrate OpenNebula with OpenVZ. Finally, we were happy to find out that SARA’s OpenNebula HPC Cloud is now in production, and we learned a bit more about how OpenNebula is used at CERN and FermiLab. We have started creating a series of screencasts to illustrate the most improtant features of OpenNebula. This first screencast demonstrates how easy it is to register new Images, create Templates, instantiate Virtual Machines from those Templates and accessing them through the embedded VNC. In addition we’ll get an overview of Sunstone and it’s major features: the Dashboard, where you’ll see the current status of your cloud, the detailed information panel for each resource and the real-time update of resources and the Dashboard. The OpenNebula Cloud offers a virtual computing environment accessible through two different remote cloud interfaces, OCCI and EC2, and through a web interface, OpenNebula Sunstone. These three mechanisms access the same infrastructure, i.e. resources created by any of the mentioned methods will be instantly available on the others. For instance, you can create a VM with the OCCI interface, monitor it with the EC2 interface, and shut it down using the OpenNebula Sunstone web interface. This Cloud has been migrated to the last OpenNebula version, 3.0. If you have an account you can still use your old username and password. If not, request a new account and check out the new OpenNebula 3.0 features. These interfaces will show you the regular user view of the Cloud, but you will not be able to manage ACLs, hosts, groups nor users, since that will be delegated to the oneadmin group. C12G Labs today announced that it has entered into an agreement with Logica France, a business and technology service company, to offer cloud solutions to clients. Utilising C12G Labs OpenNebulaPro product, Logica completes its cloud computing services with open-source based enterprise grade cloud offerings. 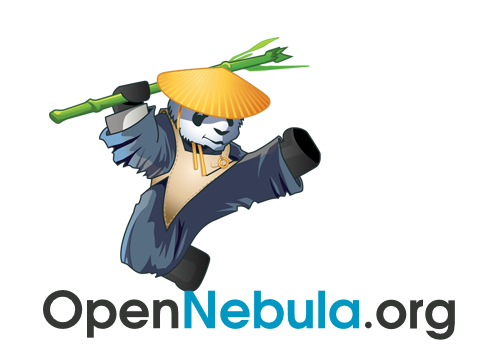 OpenNebulaPro is the supported and certified enterprise-grade distribution of the widely used OpenNebula toolkit for cloud computing. OpenNebula is used by thousands of organizations to build large-scale production public and private clouds using KVM, Xen, VMware and Microsoft Hyper-V, and hybrid clouds using Amazon Web Services. The cloud management tool includes features for integration, management, scalability, security and accounting that many enterprises IT shops need for cloud adoption. “Combining Logica’s business consulting approach and high quality open-source products, we help our clients to accelerate their business transformation to the cloud, improving their IT’s agility while significantly reducing costs and unplanned downtime with a reliable, scalable and opened cloud infrastructure stack built around OpenNebulaPro” commented Patrice Lachance, Manager IT Consulting at Logica France, at the initiative of the partnership. Logica is a business and technology service company, employing 41,000 people. It provides business consulting, systems integration and outsourcing to clients around the world, including many of Europe’s largest businesses. Logica creates value for clients by successfully integrating people, business and technology. It is committed to long term collaboration, applying insight to create innovative answers to clients’ business needs. OpenNebula 3.0 (Codename Iris) Released! OpenNebula 3.0 features the latest innovations in cloud computing for the deployment of cutting-edge enterprise-ready on-premise IaaS clouds. The OpenNebula Project is proud to announce the third major release of its widely deployed OpenNebula Toolkit, a fully open-source enterprise-grade cloud computing tool for the complete and comprehensive management of clouds and virtualized data centers. OpenNebula 3.0 delivers availability, reliability, scalability, security and efficiency with a focus on allowing data centers to provide cloud services by leveraging their existing IT assets, instead of building a new system from the ground up, thus protecting existing investments and avoiding vendor lock-in. Most of the new innovative features have been developed to fulfill the needs of leading IT organizations running production environments. OpenNebula is helping many organizations make the transition toward the next generation of cloud infrastructures by supporting multiple fully-isolated virtual data centers, advanced multi-tenancy with fine-grained access control, and multiple zones potentially hosted in different geographical locations. This new release also brings important benefits to cloud users and administrators with a greatly improved SunStone GUI that provides easy access to all the new features in 3.0 and a new oZones GUI to manage zones and virtual data centers. Other features included in this release include new authentication methods with usage quotas, a VM template repository, a new monitoring and accounting service, and a new network subsystem with support for Open vSwitch and 802.1Q tagging. “This new version has matured thanks to our large user base and the expertise gained since we released the first version of OpenNebula more than three years ago”, said Ignacio M. Llorente, Director of the OpenNebula Project. “We really appreciate the valuable support, software contributions, and feedback from our active and engaged community”. “The third major release of OpenNebula brings the latest innovations in cloud computing. There is no cloud manager offering similar levels of flexibility, performance, control, and availability”, said Ruben S. Montero, Chief Architect of the OpenNebula open-source project. https://opennebula.org/wp-content/uploads/2018/11/opennebula_cloud_logo_white_bg-4.png 0 0 Ruben S. Montero https://opennebula.org/wp-content/uploads/2018/11/opennebula_cloud_logo_white_bg-4.png Ruben S. Montero2011-10-03 06:44:002011-10-03 06:54:52OpenNebula 3.0 (Codename Iris) Released!